BOSTON - Thursday, April 26, 2018 - Mayor Martin J. Walsh today presented his $2.4 billion Imagine Boston Capital Plan (Fiscal Year 2019 - 2023), which makes critical investments in every Boston neighborhood, guided by Boston's citywide plan, Imagine Boston 2030. From a new playground at Harambee Park and to a new library in Upham's Corner, to kitchen upgrades at 25 Boston schools, to new fire engines and fire houses, the City's capital investments aim to enhance all aspects of Boston's neighborhoods and provide more opportunities for Boston's working families. Demonstrating the City's leadership and commitment to sustainable funding for the arts through the Percent for Art program, which will support the commissioning of public art. "It's our priority to create growth and opportunity for every Bostonian in every neighborhood," said Mayor Walsh. "Investing in initiatives and projects that bring shared growth, success, and greater equity is critical for our city to reach its full potential. Our budget is focused on making long-term investments that continue to lift up Boston's middle class, as we ensure Boston is a city that works for all its families." Under the Imagine Boston 2030 plan, the Walsh Administration is investing in the core goals of BuildBPS, Go Boston 2030, Boston Creates, and Climate Ready Boston. "I'm thrilled to see the critical investments in our parks, libraries, streets, and school buildings in this five-year capital plan," said City Councilor Kim Janey. "With the Dearborn STEM Academy nearing completion, improvements to Franklin Park underway, renovations underway to the Dudley Library, design in progress for the South End Library and its adjacent park, and significant sidewalk updates in the Humboldt Ave area, District 7 sees significant progress under this budget and five-year capital plan and I look forward to continuing the budget hearing process." Today's capital plan release complements Mayor Walsh's proposed FY19 operating budget, released in early April, which affirms a commitment to progress, opportunity and innovation by investing in Boston's neighborhoods, while building on the City's strong record of proactive fiscal management. The capital plan invests heavily in Boston Public Schools, reflecting the Walsh Administration's $1 billion commitment to upgrade Boston's classrooms through BuildBPS, its ten-year school facilities master plan. The largest investment in the Capital Plan, a new building for the Boston Arts Academy, allocates $124.8 million for design and construction in partnership with the Massachusetts School Building Authority. The new school building will support the BAA's dual arts and academic curriculum. In addition, the budget will invest in kitchen upgrades at 25 schools through Boston's My Way Cafe program, an initiative designed to increase access to healthy, freshly-prepared meals for all BPS students. Upgrades at school kitchens will enable the implementation of a fresh food program that will launch in fall 2018. New kitchens will allow schools to prepare healthy meals on site, building off the successful "hub-and-spoke" model piloted in East Boston last fall. The City's capital plan will also invest in school infrastructure, as well as equitable, accessible facilities. This includes $7.3 million for new windows at the Horace Mann/Jack Mann School; $1.35 million for new windows at the Henderson Inclusion Lower School; $1.3 million for electrical improvements at four schools; $2.6 million for a new roof at Madison Park Vocational Technical High School; $4 million to complete accessibility renovations at the Henderson Inclusion Upper School; $840,000 at the Curley K-8 school for rebuilding the school's connecting bridge. $2.8 million will be invested to renovate locker rooms at Brighton High School and $822,000 will be invested at the Sumner School play yard. Since unveiling the City's Go Boston 2030 transportation plan, Mayor Walsh has continued to prioritize strengthening and creating transportation options that are safe, reliable and equitable. The capital plan invests in these large-scale infrastructure improvements, including an $18 million multi-year Massachusetts Avenue bridge project; a $100 million investment to rehabilitate and renew the Northern Avenue Bridge; and a $218 million investment to build a new North Washington Street bridge. Vision Zero, Boston's commitment to focus the City's resources on proven strategies to eliminate fatal and serious traffic crashes in the City by 2030, is also represented in Boston's capital plan. By increasing certain parking fines in FY19, the City will produce positive results by changing driver behavior and reducing congestion in high traffic areas. Updating parking fines will also allow the City to make $5 million in investments in transportation projects and continue implementing Go Boston 2030's core initiatives. The $5 million will go directly towards building 15 Neighborhood Slow Streets projects, 15 miles of protected bike lanes, and improve 15 of the most challenging intersections in the next four years; improve management of traffic signals to increase safety and reduce congestion; establish the City's Transit Team to better coordinate with the MBTA; continue the multi-year campaign to bring all crosswalks, lane markings, and bike lanes into a state of good repair; and improve access and safety for pedestrians and cyclists visiting our Main Streets business districts. From Melnea Cass Boulevard to Summer Street, the City is investing millions of dollars in safe, accessible roads and sidewalks. This includes a $4.5 million allocation for the reconstruction of Quincy Street roadway and sidewalks; $3 million for the reconstruction of streets within Madison Park Village; $8 million investment for the completion of infrastructure improvements for Boylston Street and Audubon Circle, including new bicycles and pedestrian paths; and $7.4 million investment in the reconstruction of Summer Street, including improved roadways, sidewalks, street lights, and a cycle track from Fort Point Channel to Boston Wharf Road and planning for future improvements from the BCEC towards South Boston. In addition, the City of Boston is taking the initiative to improve economic mobility and strengthen Boston's core and emerging industries and small businesses. The FY19 Capital Plan has allocated roadway improvements from Shawmut Avenue to Harrison Avenue including six key Dudley Square intersections. The scope of work includes geometric changes, new traffic signal equipment and timing, bike lanes, and streetscape improvements. We will also be investing in roadway improvements to Washington Street from East Berkeley Street to Herald Street, and Traveler Street between Washington Street and Harrison Avenue. Improvements include resurfacing, pavement markings, and new traffic signals. Transportation improvements means creating a healthier, more accessible Boston -- and that also includes the City's investment in rebuilding the Long Island bridge. Through this capital plan, Boston will invest $90 million in rebuilding the bridge to Long Island. On Long Island, Boston will create a long-term recovery campus which will serve those individuals in and around Boston who need access to recovery services. Parks and open space are some of Boston's most loved places, and the capital budget continues to invest in preserving and improving open spaces for Boston residents, and generations to come. With this capital plan, the Walsh Administration will invest in the largest-ever capital funding for Boston parks. These investments include $6.3 million to complete the construction on Phase 1 of the Smith Playground in Allston-Brighton; a $4.4 million investment in Cassidy Field; a $4.2 million investment in the South Bay Harbor Trail, which will serve as an important link in the City's Greenway; $3.9 million to improve Noyes Park; the completion of Martin's Park, a universally accessible park near the Children's Museum; a $4.8 million investment to revitalize the pathways around Jamaica Pond; a $5 million investment in the Garvey Playground; and $6.2 million for the continued renovation of Harambee Park. In addition, more parks and playgrounds throughout the City will receive funds to improve their facilities, such as Ramsay Park in the South End and the Edwards Playground in Charlestown. In addition, this capital budget will invest in long-term planning for Boston's most iconic park -- the Boston Common. The capital plan sets aside $500,000 to develop a master plan to bring the nation's oldest public park to the level of excellence commensurate with its historical importance and use by the City's residents and visitors. The budget also invests $800,000 into Franklin Park, to develop a master plan that will enhance historic Franklin Park as a keystone park in the geographical heart of the City. The City's Capital Plan for BCYF targets an increase to programming capacity at the City's community centers and supports high-quality facilities. Community centers provide families, children and teens with enriching programs such as after school care, athletics, job and computer training. We are investing in renovations in our community centers to upgrade community centers as well as BCYF pools around the city to ensure a fun and safe environment for all of the community members that seek to utilize the facility. We will complete the nearly $3 million renovation at the BCYF Gallivan Community Center introducing air conditioning to the gymnasium, replacing the roof and gym floor, and upgrading the fire alarm and emergency lighting systems. We will be investing in a $15 million major renovation that will allow the center to receive the repairs and upgrades necessary to offer many additional resources at the BCYF Curley Community Center. An additional $1 million in funds to renovate and upgrade locker rooms and pools including filtration systems, pool liners, and dehumidification and HVAC systems at various BCYF/BPS pool facilities. 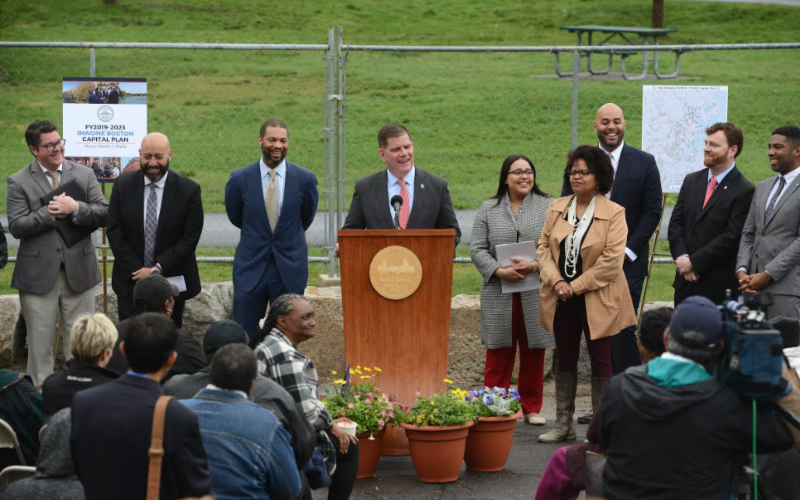 Building on the success of the first phase of Climate Ready Boston in East Boston and Charlestown, the capital plan will allocate an additional $1.6 million to further resiliency initiatives to protect the city and provide more detailed reviews of additional neighborhoods. This includes an additional $600,000 for climate resilience planning for City neighborhoods and municipal facilities affected by climate change. It also includes $1 million to support the development of a study that will examine the feasibility of constructing a barrier in Boston Harbor in response to expected sea level rise due to climate change. The Renew Boston Trust was launched during the Walsh Administration and has systematically identified energy efficiency projects in the City's 315 buildings to both lower energy bills and reduce emissions. The City finances the program through general obligation bonds and utilities efficiency incentives, and it will be paid for from reduced energy consumption at City departments. A $12 million Phase 1 is set to begin construction this year, and the FY19-23 Capital Plan will nearly triple the size of the program to $42 million for a future Phase 2. This plan reflects an effort to continue the Administration's work to encourage housing production, increase affordable housing options, and reduce displacement. Municipal finance law does not allow the City to use city capital dollars to support private housing, but does allow public infrastructure projects to enhance housing development. Included in the plan is the Whittier Street roadways projects that will reconstruct roads and sidewalks in the Whittier Street housing development in conjunction with a $30 million HUD grant. This investment will revitalize the development and surrounding neighborhood. The Whittier Choice project will ultimately create a total of 387 mixed-income rental units. Also in the plan is the Madison Park village project, that will reconstruct streets within the Madison Park Village of Roxbury, bounded by Melnea Cass Boulevard and Tremont Street. The Madison Park project will be comprised of a four-story building with 16 units and a five-story building with 60 units located near the Ruggles MBTA Orange Line station. With this capital plan, Boston will invest in creating new branch libraries, including a $12.6 million investment to build a new addition at the Faneuil Branch Library in Brighton; a $18.3 million investment in the design and construction of a branch library at Adams Street Library; a $18 million investment in the development of a new Upham's Corner Branch Library; and a $12 million investment to support the construction of a new facility for the Fields Corner Branch Library. This budget also invests in renovating existing library, from a $17.2 million renovation of the Dudley Branch Library in Roxbury, to a $10.2 million investment in renovating the Roslindale Branch Library. FY19 also marks the second year of the City's Percent for the Arts program, a program that dedicates one percent, or $1.7 million, of the City's annual capital budget for commissioning permanent, public art in municipal spaces. The Walsh Administration's investments in the recommended budget and capital plan provide a comprehensive and multi-disciplinary approach to violence prevention and public safety that emphasizes opportunities and pathways away from violence. With a growing population and changing neighborhoods, Boston needs reliable public safety facilities that help meet the needs of Boston's residents. The City will complete the design for a new $29.9 million East Boston Police Station this year. Another investment of $48.2 million will ensure that new fire stations at Engine 42 in Egleston Square and Engine 17 on Meetinghouse Hill are designed and equipped to both protect firefighter health and safety and meet the public safety needs of our growing city. The City and Boston Public Schools will also increase its investment in school security to a total of $5 million, representing a $2 million increase from the previous year. The project includes upgrades to external and internal doors, locks and key cards, intercom, motion detectors and cameras. Additionally, $2 million will be allocated for the Boston Housing Authority (BHA) to begin planning for the installation of additional security cameras at BHA locations.